By the end of the 1930s, Oliver’s large tractors were ranking nicely among competitors, giving them a good deal of success. Oliver had not yet built a small tractor, however, so they were losing out on what was a very quickly growing segment of the agriculture market. Allis-Chalmers, John Deere, and Farmall had done very well in the “small tractor” category, and Oliver wanted to begin competing. Oliver released the Oliver 60 to the market in 1941. It was basically a smaller version of their previously popular Oliver 70. It had a four-cylinder, water-cooled engine, and a four-speed transmission. At a fast 1,500rpm, the PTO power was 18.3hp. The tractor weighed 2,450 pounds, nearly half the weight of the Oliver 70. The Oliver 60 was available in three versions, with different production years: Standard, Row Crop, and Industrial. The Standard 60 had a four-wheel design, similar to that of an automobile. The Row Crop’s wheel placement was more like a tricycle design, with two smaller wheels next to each other in the front-center of the tractor. The Industrial version of the 60 is set up more like the Standard, with the same wheel placement. The color, however, is yellow instead of the standard Oliver green. When using the higher end of the transmission, the top speeds were faster, as well. We have an Oliver 60 Row Crop that is either a 1941 or 1942. Where on the tractor would we be able to find the serial number. This tractor will be up for auction on Aug 13th in Wadena Minnesota so I would like to know where to find the serial number. I am looking to sell an Oliver 60 row crop. Hi, does anyone know where I could find a crank pulley for an Oliver 60 tractor? Thanks for all the help. Looking for the front nose to the Oliver 60 row crop, and 2 sets of wheels or if you have a tractor that is for sale that the parts are good and at a decent price and that is not to far away so that we can pick it up or look at it. Looking to purchase an Oliver 60 standard 1944. I am looking to buy an Oliver 60. I would prefer a standard but would consider a row crop. Thank You. For sale: I have sixty series Oliver, with a crank you still turn over, in Berrien Springs, MI. 126-943-6181, thanks Mike. I have a grille shell from an Oliver 60 removed from an old 20s hotrod. The two grille sections and streamlined bullet nose shaped section are in good shape and rust free. the center divider panel is a flat piece of metal — not one with the Oliver script on it. For sale just south of Portland Oregon in Newberg. Pics upon request. 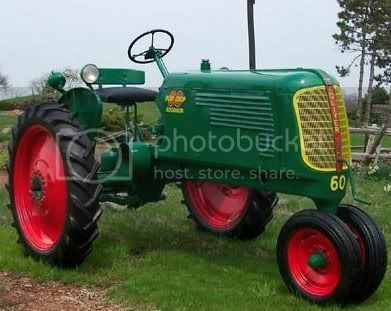 I have an Oliver 60 row crop tractor for sale. I’m not sure what the serial number or year is yet. It does run and is in working condition. The engine needs a set of rings as it does burn a little oil. You can call me at 641 780 5 3 2 1 for more information. Serious inquiries only please. I have an Oliver 60 Rowcrop, restored, for sale. Make an offer. I can email or text pictures. Older Oliver that my father had. I have been looking for a picture of one like it can cannot find one. My memory is that he got it used on the black market. I wouldn’t know what year he got it, but probably ’41 or ”42. The perplexing part of this is that all the Oliver 60s and 70s pictures I find have sort of an angled front/angled grill. My uncle had one like that, and my memory is that it was a 70. (did they go “77”?). My father’s had a squared-off front end; no electric anything on it, and no power takeoff, just the belt drive. Looking at Oliver history, I don’t see an accounting of what I suspect, but I suspect that he had one of the very first Olivers after they took over Hart-parr. It was row-crop, and he had both steel wheels front and back and standard rubber, which he kept on. Why isn’t there any information on the five speed transmission? Oliver made one in 44 or 45, I have one, and six speed after that but, no information on either. The only one available is the four speed and maybe the least number of tractors built. I have mine restored and everything is ok but, I would like some information on it.